What if virtually every variety of debt security were still overvalued? What if, to put it another way, the aggregate demand for debt securities had fallen off dramatically and never returned to its pre-crisis state? 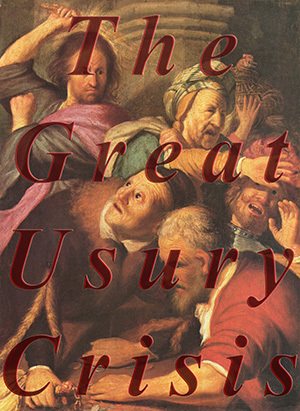 What if virtually every imaginable mechanism of accounting legerdemain, every method of budgetary chicanery, every generous wink-and-nod easement, every facility of subtle support for usury, had been employed in the effort to prevent the pain of that massive loss in demand from being felt? Back up a step. What if, right alongside an unprecedented rhetorical attack upon and regulatory harassment of business enterprise, we were living under an unprecedented coddling of finance capitalism? Well, these are tough questions that I do not propose to answer with any finality. But I do think that, at the highest levels of financial sophistication, the global political economy is still in such a state of flux and disorder that any statement pretending toward finality ought to be treated with the utmost skepticism. Thus I do think that we must strive by all the means of our appointment, to apprehend that the political economies of the world are still adrift in uncharted seas. Uncertainty still reigns supreme; and we all must be ready to observe and record facts that may well disturb our prior certainties. We have to keep these sorts of questions open, and maintain a hardy skepticism of that ideological frame of mind which would close them prematurely. Consider the absolutely extraordinary reversal in the political-economic dynamics between the US and Europe. To me is a truly staggering feature of the last six months. Something has really put the scare in European leaders; to the extent that real honest-to-goodness fiscal austerity, far from being merely proposed in oratory, or recommended by wonky analysts, is actually being implemented, right in the teeth of the usual union-led demonstrations. Meanwhile, the US has only gotten as far as a few lower-level pols and former pols throwing out some austerity-like ideas. On the American Right, the newest hotshot — a paunchy and pugnacious Governor of New Jersey — is only just now pressing openly (and then only at the state level) for the kind of policies that European leaders like David Cameron and Angela Merkel have started to implement at the national level. Then there is the old union-friendly paleo-Left in America, those aging social democrats of Marxian cast: these guys have spent their entire careers praising European redistributionist politics, and now the poor fellows find themselves driven by events to curse and harangue the same. I hasten to add that for myself, at least, the question of whether fiscal austerity is wise — whether current European policies are the best ones — ones that we should emulate — is a question I’m going to resolutely keep open. I’m happy to let the Europeans run this experiment first. It’s possible that austerity will prove both wise and necessary (it will never, I am convinced, prove popular, despite the populist agitation that appears to support it). But it is also possible that it will prove a craven capitulation to usurers and plutocrats. Last week European officials, as reported by the Financial Times, had to come out and reassure bond investors that any “haircut” on their investments in public debt securities will be purely “voluntary.” And Angela Merkel has been catching flak all week for suggesting that private investors should shoulder some of the burden in this Irish mess. Haircuts of a different sort, meanwhile, are contemplated for the middle classes of the West. In Europe (since so many of the middle classes are public sector workers) it will come in the form of benefits, salary and job-security reductions; while in America it may well take the form of new taxes. The US deficit commission has floated the idea of removing the mortgage interest deduction, which would frankly be a punch in the gut to millions of middle class Americans as well as another shock for the anemic US housing market. As I say, we face some really tough questions; and I’m suspicious of anyone who thinks he’s got the ready answers. But the one proposition I am fairly confident about is that it is high time we acknowledged (and this goes especially for people on the Right) that business enterprise and finance capitalism are not the same thing. Perhaps the simplest way to describe the difference is to say that if you’re in business enterprise, you’re exposed to very high risk of failure and bankruptcy, while if you’re in finance capitalism, you’re protected from such risks by means of an astonishing proliferation of machinations and arcane subtleties. This would explain, in part, the rush of big industrial firms over the past few decades to get into securities markets. From AIG to GM to GE to Walmart, for many years it redounded to the corporation’s benefit to become a major player in some particular niche of securities trading: that was the path to the promised land of Too Big to Fail, where downside risk is absorbed by taxpayers, freeing the firm to chase after more and more exotic products in the race for interest yield. If, being a big bank, you deal directly with the Federal Reserve (or any other monetary authority) there is a good chance that, in a pinch, you can cheerfully sell government securities (at inflated values) for new currency that didn’t exist before the sale. In other words, you can sell a stagnant or highly volatile security and get newly-created money in return. That this operation is given a puzzling piece of jargon as its name — “quantitative easing” — and is undertaken with apparently genuine assurances that it will help the broader economy too, in no way alters how nice a deal it is for the primary dealers. When you add this in with all the other sweet deals extended to banks since the crisis of 2007-08, you start to realize that maybe the banks couldn’t survive at all without sweet deals — lots of sweet deals, all wrapped in a similar shroud of technical obscurity. So here is another hard question: did our banking crisis ever actually end? Maybe, in fact, the sweet deals are little more than a complex structure of life support measures — increasingly desperate life support measures — for a financial system still saddled with vastly overvalued debt securities. Last week European officials, as reported by the Financial Times, had to come out and reassure bond investors that any “haircut” on their investments in public debt securities will be purely “voluntary.” And Angela Merkel has been catching flak all week for suggesting that private investors should shoulder some of the burden in this Irish mess. Could you explain this a little more, Paul, for those of us who have trouble understanding this financial stuff? What does it mean for European officials to tell bond investors that a haircut on their investments in public debt securities will be voluntary? What would such a haircut look like? What would it mean for it to be voluntary? What would it mean for it to be involuntary? On Merkel's comment, what would it mean for private investors to shoulder the burden of the Irish mess? What would it mean for them not to do so? On the American scene, I follow (I think) quite clearly what you are saying about banks and quantitative easing. That part, I've got. And I know I'm agin' it. But I assume that's not what you have in mind throughout the entire post as regards the government's somehow "letting off" investors or helping out "plutocrats" (and as you say, the little old lady with her fixed income coming from stocks is hardly a plutocrat!) or making their haircuts voluntary, etc. Irish banks are desperately insolvent. That is the first fact. Their obligations probably exceed all of Irish GDP, thus making Ireland insolvent. That's the second fact. So the Germans have been saying for awhile now (ever since it became clear that an IMF/EU bailout of Ireland was in the works) that the counterparties on these debt obligation - that is, the investors who lent to Irish banks and to the Irish government - have to be part of the bailout. How that would work out precisely is anybody's guess, but generally a "haircut" means the bond investor loses some chunk of his investment - he gets 80 cents on the dollar or something. Another jargon term you might see is a "cramdown." In other words, the Germans are saying that the creditors to Ireland must provide some of the capital to rescue her banks and her government from insolvency. A simple way in which to give bond investors a haircut would be for the relevant central banK to raise its inflation target. One reason why the Fed's QE II will be relatively ineffective is its failure to do that. Your point about the profit that institutions will make on previously purchased securities would also be addressed as an "inflation tax" would negate that profit. "What if virtually every variety of debt security were still overvalued? What if, to put it another way, the aggregate demand for debt securities had fallen off dramatically and never returned to its pre-crisis state?" Not so. In fact, that the demand for safe debt securities has risen is at the heart of the present crisis. A glance at the yield curve for U. S. Treasury debt will make this clear. That is why fiscal policy remains the best policy. How do yield curves look with no central bank interventions? QE II is specifically designed as an unorthodox method of reducing interest rates in the middle of the US yield curve. The ECB, the Bank of England, the Bank of Japan, plus the Chinese and Swiss more quietly, have been busy for over two years throwing their weight around in government bond markets in mostly unprecedented ways. So I think the question needs to remain open. "the one proposition I am fairly confident about is that it is high time we acknowledged (and this goes especially for people on the Right) that business enterprise and finance capitalism are not the same thing." Very true. One problem is with the looseness of the terminology. It is common to use the word "capitalism" for both, which confuses the matter on both the Right and the Left. A mistake that many on the Right make is believing that that the difference between the two is simply a matter of size, that the difference is merely quantitative rather than substantive. The Left, on the other hand, tends to view all capitalism through its industrial/finance/corporate manifestation. I've sometimes used the term "small market capitalism" to describe the type of business enterprise I support, over against finance capitalism. But that doesn't quite capture it, and again relates it too much to size, I think. How that would work out precisely is anybody's guess, but generally a "haircut" means the bond investor loses some chunk of his investment - he gets 80 cents on the dollar or something. So it's like declaring bankruptcy? The creditors get a certain percentage of their investment back? There are, of course, huge sovereignty issues, here. My understanding is that Merkel isn't just suggesting this or that as a piece of friendly fiscal advice from a bystander. Rather, the idea is that Ireland would get an EU bailout at the price of agreeing to this. At that point we have more questions involved than simply, "Does this make some kind of fiscal sense?" There are usually major haircuts in bankruptcies, yes. But part of the reason why debt is preferred to equity is that it's in a better position in the capital structure, and thus poised to make out much better in the event of a bankruptcy. From a certainly perspective, you could say that the German position is that the Irish bailout should have more of the aspects of bankruptcy. The sovereignty issues are huge as well. I agree with that. Keep in mind that Germany, being the largest Eurozone economy, will naturally have to foot the largest portion of any bailout. Add to that the fact that Germany's economy is doing fine, and you start to see why Merkel is reluctant to stake German taxpayer capital to rescue Irish financiers. Sure. I understand Merkel's concerns. My position is just more radical than her particular set of cautions and conditions. I don't think there should be an EU, and I don't think the EU should bail out Ireland, and I think Ireland should keep both its own problems and its own sovereignty. Larry Kudlow (about as mainstream a supply-sider as you can get on the Right) was on the radio here in Chicago this week saying that he didn't understand why bondholders weren't forced to take a haircut -- his big concern was moral hazard related to the bailouts (remember that most of those Irish banks were actually bailed out by the Irish government). So without a haircut, no one has to face the consequences of their bad decisions and we rinse, lather and repeat in a couple of years. That's the advantage of haircuts. Their obligations probably exceed all of Irish GDP, thus making Ireland insolvent. That's the second fact. Not so fast, you are confusing income and balance sheet terms. the relationship of obligations and GDP is not direct, though of course they are somewhat related. Generally, one is insolvent if unable to pay your debts as they come due. Ireland's obligations (a balance sheet concept) could be three times GDP (an income statement concept) and it says nothing about Ireland's solvency without knowing what other liquid assets Ireland has or the tenor of when those obligations are due. In this regard short term liabilities are much worse than long term liabilities. The other issue here is that the Irish banks' obligations could be 100 times GDP and it wouldn't make Ireland insolvent but for the fact that the Government of Ireland publicly announced in 2008 that they would stand behind all of the banks' obligations. Unless that promise was documented in some fashion, it is probably not enforceable. So Ireland could avoid the need for the EU bailout simply by saying "Sorry, we were misled about how truly effed these idiots were. We're done." Downside of that is that Ireland's banking system probably collapses with currently unknowable results. Upside is that it might in fact be substantially cheaper for Ireland to start a batch of new banks. Politically, it is curious that the Irish government is so bent on impoverishing Irish taxpayers to bailout bank investors who presumeably include large numbers of non-Irish. That wouldn't seem to be sustainable. "How that would work out precisely is anybody's guess, "
Holders of Anglo-Irish subordinated debt face an interesting situation. They are to vote on accepting an offer. The offer is 20% of face value for those voting to tender their bonds should a majority so vote. Holders who vote not to submit, should they wind up in the minority, will be paid one cent per 1,000 Euro face value. Al, that's cool - a kind of prisoner's dilemma. If you're among the last to give in, you are really, really screwed. Make sure that holders who don't vote have an even worse outcome - maybe they have to foot the bill with their other assets? I thank John Seymour for his corrections and refinements. Al, from that article -- "While the ECB isn’t supposed to take the credit risk on its facilities, any default on those bonds without the proper agreements and accounting fictions in place would mean that the ECB would be making claims on insolvent banking systems for the lost value, and would itself probably have to be recapitalised." How droll. Who's going to save the ECB when Trichet comes around, hat in hand? That such talk can even enter the public discussion shows how acute the crisis still is. Some haircuts must begin at the neck. "The criminal and civil probes, which authorities say could eclipse the impact on the financial industry of any previous such investigation, are examining whether multiple insider-trading rings reaped illegal profits totaling tens of millions of dollars, the people say. Some charges could be brought before year-end, they say. The investigations, if they bear fruit, have the potential to expose a culture of pervasive insider trading in U.S. financial markets, including new ways non-public information is passed to traders through experts tied to specific industries or companies, federal authorities say."